What: Family farm and art event all people welcomed and appreciated. We’ll be doing a variety of farm building projects suitable for all ages. Some of the tasks we’ll do are: organize the plant nursery and repot larger plants, fill in the hose bib and irrigation trenches, build more forest floor by sheet mulching, plant beneficial plants around our trees, broadcast some seeds, build retaining walls for the P-Patches, build community and share a meal. Dress appropriately for the weather, wear sturdy shoes and bring your work gloves. We need tools and wheel barrows. Please bring an item of clothing to donate to our community sculpture project, see description below. Food: There will be a Biochar stove demonstration that will cook some pizza for lunch and create nutritious soil amendment at the same time. Never heard of a Biochar stove? come by on the 18th and check it out. We’ll also have pasta and sauces, bread etc and hopefully some desserts if anyone offers to make some. If you contribute a food item lunch is on us, for all others we ask 2$ suggested donation. Please contact Judi at foodforestvolunteer@gmail.com if you have questions. We would like to turn our construction fencing into a soft sculpture symbol of community power. Please bring one or more items of clothing to donate to the May 18th Work Party to decorate the fence. Strung up on a long fence, long sleeve shirts will look like they are holding hands, pants will be their legs, and hats may be their heads. Farmer’s overalls and uniforms are one complete package. Long sleeved children’s clothing will look like they are holding and swinging from the arms of their family. We would love to see over 100 linear feet of community cloth decoratively surrounding the BFF. And we share, if you are walking by and need a little more warmth (or style baby) you can gather it, you can practice your Beacon Food Forest ethical harvesting skills! Please bring at least one, ARTicle of clothing to decorate/donate to your fence as a massive symbol of community support. If you have sturdy safety pins bring those too we’ll also have some. This is a temporary installment but hopes to be effective while up. All clothes will be donated to Goodwill when they come down. Questions about this project contact glennherlihy@speakeasy.net. Juniper Timber ADA bed retaining walls are complete. Thank you Timber Team. Sign Project is progressing beautifully, soon we will have a world class self guided tour of the scientific and social benefits of food forestry on site. Steering Committee (SteerCo) is working hard on governance and guiding principles. Go Steerco! Site Development Committee meets every Tuesday at the BH Library 6:30pm. Absolutely persistent power! We are continuing to experience country wide media attention and massive Face Book participation. BFF is positive change, by acting local and effecting the global. Remember that bumper sticker? you are achieving it. Next work party June 15th. 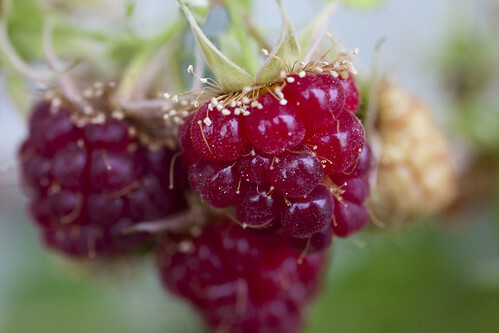 Raspberries photo by Chris Gladis via Flickr/Creative Commons. The Friends of the Beacon Food Forest invite all interested neighbors to a meeting this Saturday, March 9 from 1 to 4 p.m. to help design the Forest’s Gathering Plaza. At the meeting, the community will have an opportunity to give opinions and share design ideas about structures to be built at the Food Forest site this spring. The meeting is at Jefferson Community Center, 3801 Beacon Ave. S. It will be facilitated by the UW Design/Build Group and the Friends of the Beacon Food Forest. Our next Work Party is Saturday February 23rd from 10am to 2pm on the BFF site. The site is located on the very SW corner of Jefferson Park Beacon Hill. Cross Streets, 15th Ave S and S. Dakota St. Please bring your work gloves and dress appropriately for the weather. Expect wet earth on your feet. This is a family event open to all people, please share this notice with your friends and families. We will be continuing our work on the Lower Bench’s Fruit and Nut Grove by sheet mulching and building our forest floor. We’ll be planting some trees and shrubs as well. Many of our food forester’s now have experience with sheet mulching bed building and we are counting on this experience to help us use our time efficiently while educating those who look to expand their knowledge in no-tilling techniques. All interested neighbors are invited to a community meeting this Saturday, February 9 from 12 to 2 p.m. to give feedback on educational signs in the Beacon Food Forest. Designers Molly Danielsson and Mathew Lippincott will be on hand at El Centro de la Raza (2524 16th Ave S) to hear your thoughts on the signs’ proposed materials and concepts. Snacks will be provided. The Friends of Beacon Food Forest recently received a $12,600 grant to create educational signs for the Food Forest. The signs will provide information about the ecological and social processes behind the Food Forest. The signs will be installed in July 2013. The event starts at 7 p.m. at the Garden House, 2336 15th Ave. S. It’s a dessert potluck, so bring a favorite dessert to share; there will be beverages and popcorn provided. All are welcome to this family event. Along with the movie, Tlaloctecutli Dance Group will perform, and beekeeper Bob Redmond will be there with an information table and local honey. Questions? Contact Melanie at melanie.coever@gmail.com . Photo by K. Shuyler from the Beacon Hill Blog photo pool on Flickr. The Beacon Food Forest’s Ground Making day was an absolute blast. We’d like to thank the 100 plus community volunteers who came out and converted 3750 square feet of grass into the first Beacon Food Forest planting bed. It was an impressive sight to see so many people farming, smiling, eating and learning together. We planted the first plum trees and a few shrubs that arrived on bicycle trailers powered by the good people of Beacon Bikes, we shared a delicious meal supplied by Tom Douglas, Essential Bakery, Central Coop and La Panzanella, and made a lot of friends. Thank you nutrient donors! Thanks also to City Fruit and ACTrees, Seattle Department of Neighborhoods, Seattle P-Patch, Seattle Parks and Recreation and SPU for being apart of a successful collaboration. Thank you Food Foresters for making the time to become responsible stewards of your public land. Nice work people! 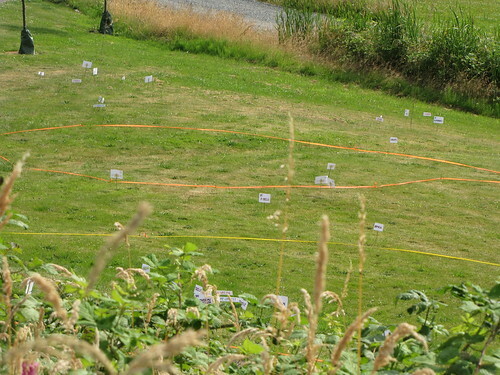 The Food Forest site was marked during July’s Jefferson Park Jubilee to show where the features of the park will eventually be. Photo by Wendi Dunlap. 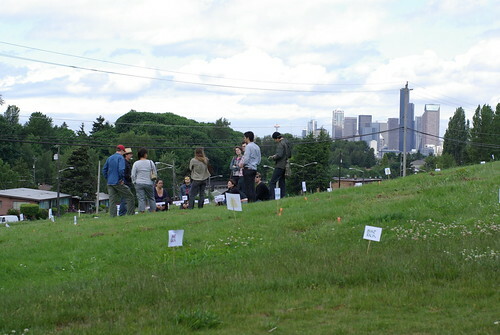 Three years into the Beacon Food Forest planning, the site is still just plain lawn. 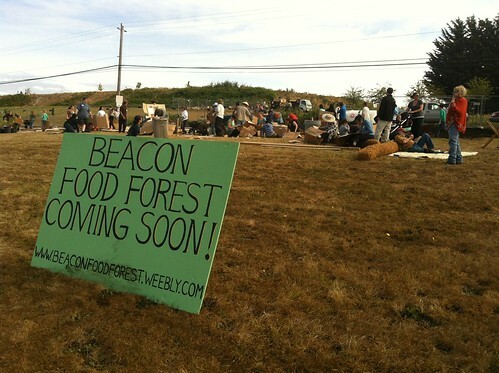 That will change on Saturday, September 29, from 10 a.m. to 2 p.m. when the forest’s first trees are planted at the Beacon Food Forest Ground Making Day celebration. All are invited to this inaugural work party to begin the transformation of the site. West African drums will be played by Katia Roberts and Friends, and there will be food provided by Tom Douglas, La Panzanella, and more. Volunteers should RSVP to Glenn Herlihy at glennherlihy@speakeasy.net, and bring their own gloves. The next day, Sunday, September 30, a tree planting workshop is scheduled for the Food Forest site from 10:30 a.m. to 12:30 p.m., taught by Jana Dilley, Seattle Public Utilities’ reLeaf Program Manager. There are 20 spaces available in this workshop to learn how to plant and care for fruit trees. RSVP to cramerjacqueline99@gmail.com to reserve a space. Both events will be held at the Beacon Food Forest site, the southwest corner of Jefferson Park, at South Dakota Street and 15th Avenue South. Beacon Food Forest fans and friends are invited to come out this Saturday (June 30) from 10 a.m. until noon, to the workshop “Permaculture and the Beacon Food Forest: Building skills and leaders for the food forest planting and care.” The workshop will be held at El Centro De La Raza, room 310, 2524 16th Ave. S.
Topics covered will include permaculture concepts, soil building, plant guilds, and leading a team in planting the first stages of the Beacon Food Forest. Attendees will begin to design plant communities and plan productive work parties. Interested in attending? RSVP to Jacqueline Cramer, cramerjacqueline99@gmail.com. Two founding members of the Beacon Food Forest will present a talk tomorrow (Saturday, June 16) about permaculture practices and how they will be used to build the food forest. The talk, “Permaculture and Food Forests: Taking care of our Fruit Trees in Holistic and Long-Lasting Ways,” is at Jefferson Community Center, 3801 Beacon Ave. S., from 10 – 11:30 a.m. According to the announcement, “We will be sharing formation on building soil, food forests, permaculture and plant communities. These skills will enable our community to care for fruit trees, including those we planted last month into pots for the fall, helping build a resilient community and local food source. If you can’t make this class, there will be another one on June 30 at 10 a.m. at El Centro de la Raza. Earlier this month, neighbors toured the Food Forest site to see where the plants and features will be. Photo by K. Shuyler in the Beacon Hill Blog photo pool on Flickr.